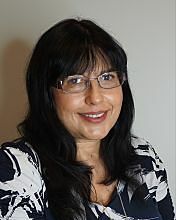 Elena has been with Kesner, Godes & Morrissey, LLC since 2004. She received her Master of Science in Taxation from Bentley University. Elena is a member of The International Honor Society Beta Gamma Sigma which is the premier honor society for the best students in business programs accredited by The Association to Advance Collegiate School of Business. She is a Certified Public Accountant and a member of the American Institute of Certified Public Accountants and Massachusetts Society of CPAs. Elena has extensive experience with audits of non-profit and for-profit organizations including Chapter 40B audits. She also prepares tax returns for various entities, individuals and business owners. Elena enjoys speaking foreign languages and is fluent in Romanian, Italian and Spanish. When she is not working, she also enjoys dancing and attending live concerts.